Today’s guest post comes from Carrie of Bakeaholic Mama. She’s such a sweetheart, and a very busy mama with three kids! Make sure you browse her blog, and don’t miss the Avocado Bacon Ranch Deviled Eggs, Red Velvet Oreo Cake, and Black Bean and Chicken Enchilada Stuffed Shells. 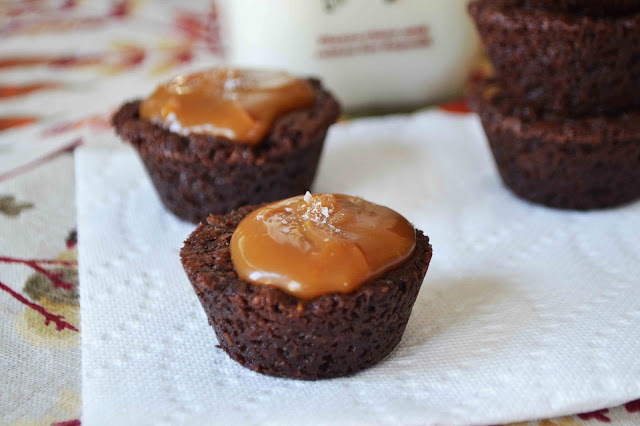 These salted caramel brownies are bite size brownies with luscious salted caramel topping. The small portion recipe will keep you from eating too many. Hi Guys! I am excited to be guest posting for Rachel as she takes some much needed time to juggle two busy kids! For those of you who do not know me I am Carrie from Bakeaholic Mama. I am a stay at home mom of three adorable crazy kids, and I have a major addiction to butter and sugar. We all have our addictions, Rachel for instance has a problem with popcorn. I on the other hand have a real problem with brownies. All of you moms out there know what it’s like to try and lose those extra pounds and the kangaroo pouch after the babies are born. I find myself counting calories, working out.. and the entire time I am dreaming of things filled with ooey gooey chocolate, slathered in caramel. It’s a problem. What does a mom who loves brownies, but wants to spend the summer in a bikini do ? My solution? Make the brownies! But only a small batch. If you are like me you… things with caramel and chocolate do not stand a chance. You have issues with self control. That big 9×13 pan of fudgy goodness is going to be eaten. It just happens and before you know it. You are look at My Fitness Pal and just weep because you have gone over your 1220 calorie goal by…. 1000. Those brownies will squash the hopes of wearing a bikini at the beach this summer. Instead of a 6 pack… you will gain a double chin. However the smaller batch of brownies made in a mini muffin pan, will ensure you only have a bite or two. Yes you might go over your calories a tad…. but nothing in comparison to that 9×12 pan of brownies. The hopes of sun bathing on the beach might just happen after all!…. Who am I kidding, I have three kids… What’s relaxation in the hot sun like? 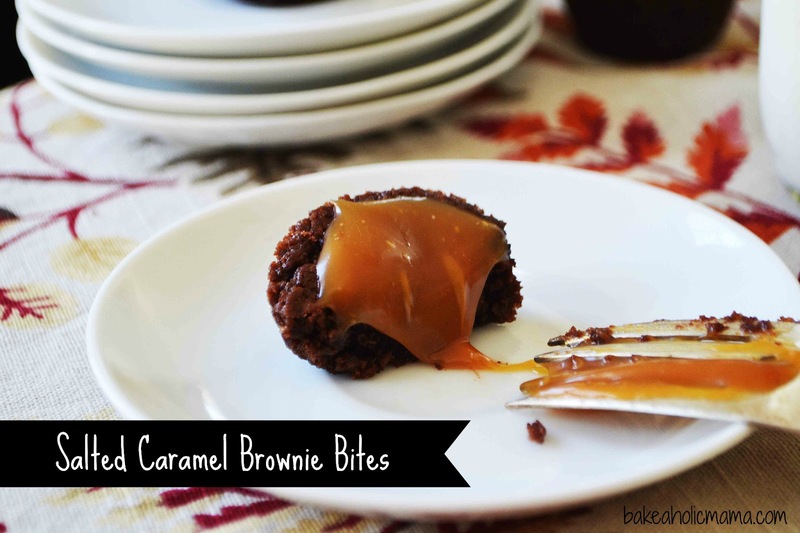 Bite size brownies with luscious salted caramel topping. Spray mini muffin cups with non stick baking spray. In a medium mixing bowl using a rubber spatula, mix together melted butter, sugar and salt. Once combined mix in your egg and vanilla extract. Add in cocoa powder and flour, scraping down the sides of the bowl just until all the ingredients have come together. Using a cookie scooper or tablespoon. Fill greased mini muffin cups about 3/4 of the way. Bake for about 15 minutes or until a toothpick is inserted in the center and comes out clean. 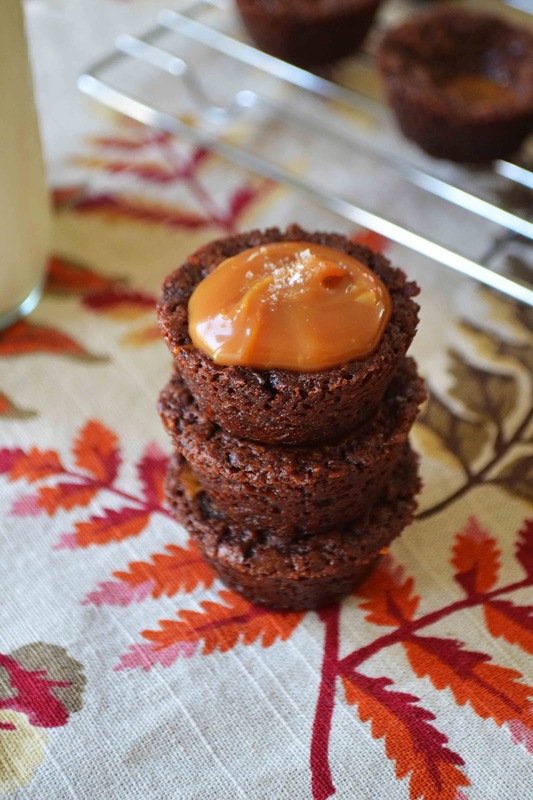 Allow brownie bites to cool before removing from the muffin tin. 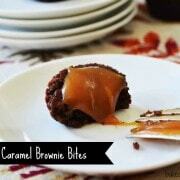 Dollop caramel dip on the tops of each brownie and then sprinkle the tops with sea salt. Thanks so much, Carrie! These look divine! 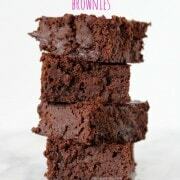 Black Bean Brownies – no one will ever know! Hi- I tried melting Kraft caramels in the microwave but they ended up being so difficult to use (1/2 the bag burned, and the other camels hardened so quickly that it was difficult to spread on top of the little brownies). Is the Marzetti Old Fashioned Caramel Dip easy to spread? Do you use a teaspoon to drop it on top? I’m making these for a baby-shower and presentation is key. Thank you! 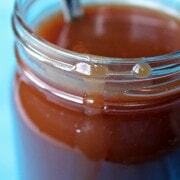 The caramel dip is very easy to spread – it’s soft and dippable (or spreadable) at room temperature. If you choose to use the Kraft caramels, I’d recommend heating them slowly over a double burner with some cream to keep them soft when they’re cooled. 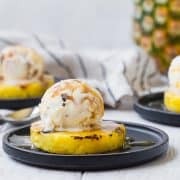 These look delish carrie! I can have such a problem with portion control..love the mini bites! All I needed to see was salted caramel and brownies and I was sold! Evil!!! :) But, they’re so small that it’s okay to enjoy! Love these! Fabulous treats from a fabulous lady! I have an obsession with brownies as well, they are my ultimate weakness. But add caramel, and I am done! Awesome recipe Carrie! I like your solution Carrie! I’m always craving brownies too. What a great treat. Thanks so much for letting me share my rambles and brownies today!